Improvise Meals You Love—from What You Have!—Plant-Packed, Gluten-Free, Your Way! Heather Crosby loves a good recipe, but most of the time, she simply cooks pantry to plate. What’s that? It’s taking stock of what you have on hand and what you’re in the mood for—and then, well, improvising! 30 ingenious recipe templates to help you freestyle plant-packed, gluten-free meals and snacks on the fly: Breakfast Cookies, Bites & Tots, Tacos & Wraps, Hand Pies, and more. Plus, 100 delicious recipes that show the templates in action, from Maple-Spiced Pear & Toasted Pecan Parfait (based on the Coconut Yogurt template) to Pesto Chickpea & Quinoa Scramble (based on the Scrambles template). Are you a recipe renegade who likes to bend the “rules”? A health-conscious cook seeking more kitchen confidence? Are you busy or tired of going shopping for just one missing ingredient? 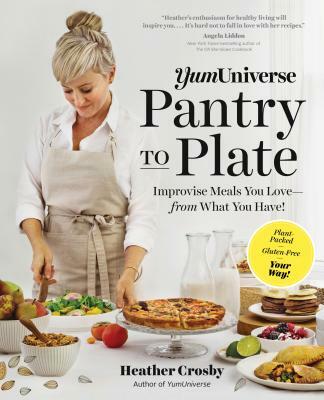 With the flexible templates in YumUniverse Pantry to Plate, gluten-free, plantiful goodness is at your fingertips. Heather Crosby’s first book, YumUniverse, was covered by HGTV.com, Reader’s Digest, and NPR’s “It’s Your Health,” among others. She is a lover of plant-inspired foods, and the recipe developer and photographer of her popular website, YumUniverse.com (100,000+ monthly visitors). She also holds a certification from the T. Colin Campbell Center for Nutrition Studies. She lives in West Virginia.